Carin Papendorp '17 MD/PhD’25 and Mac Woodburn '17, co-presidents of the Brown Brain Bee, at the Society for Neuroscience conference. At last November’s Society for Neuroscience (SfN) conference in Washington, DC, Carin Papendorp ’17 MD/PhD’25 beamed as she accepted the 2017 Brain Awareness Travel Award. For the first-year Warren Alpert medical student, the honor represents her years of volunteer service as a Brown undergraduate helping Rhode Island high school students learn about brain science and prepare for an annual Brain Bee, a statewide, national, and international competition. “My involvement as co-president of the Brown Brain Bee was a great experience and definitely contributed to my love of neuroscience,” says the Somerville, MA, native, whose initial interest in the field was sparked during high school, when she worked for a neurologist. In her junior year, she participated in the statewide Brain Bee at MIT, where she says she was nervous and underperforming. 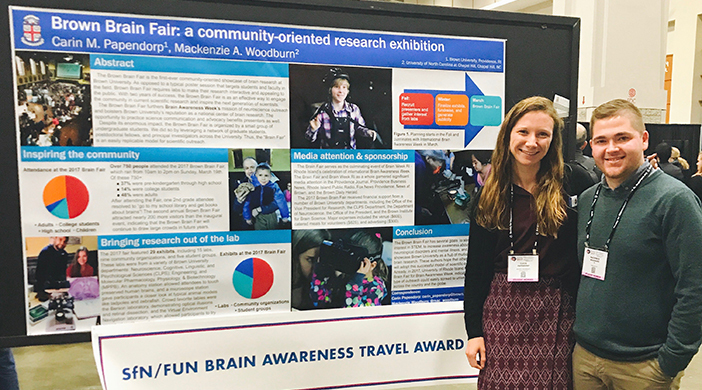 The SfN award that Papendorp received in November came with admission to the conference and $750 to cover her expenses, as well as the printing for a poster to promote Brain Awareness Week, which was earlier this month. 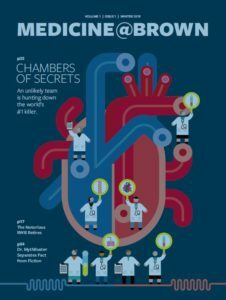 She is still sorting out the specific area of neuroscience she will pursue, but she has seen firsthand the devastation of neurological disorders. One grandfather suffered from Alzheimer’s disease and her other grandfather coped with Parkinson’s. “Everyone seems to have someone in their family who suffers from neurological disease and would benefit from brain research,” she says.